Construction industry has way too long been deprived of quality web design. 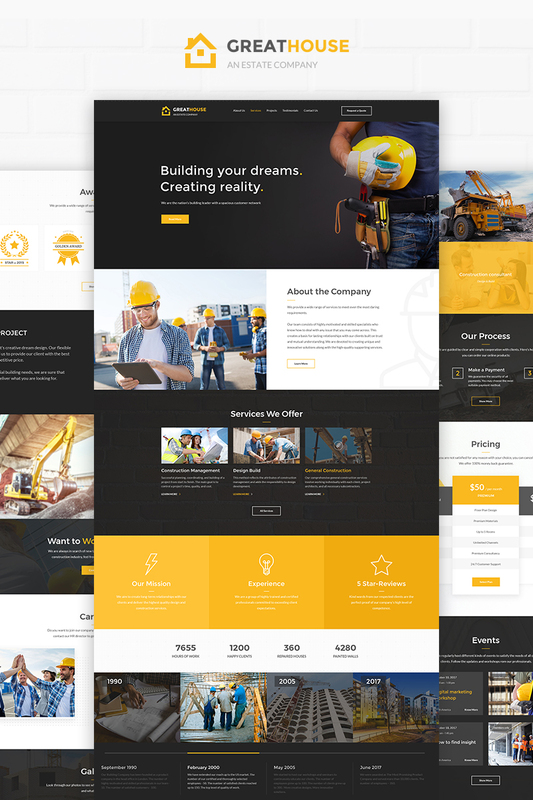 Fortunately, Weblium Construction Company website template is here to simplify and speed up website building for your business. The single-page template is based on the niche research of more than 100 construction company websites around the world. Therefore, it has everything you need to establish a solid online presence, includes 27 blocks to meet any business need. Besides, Weblium will customize the template for you so you can focus on what really matters. All you have to do now is pick the Construction Company website template, pay the deposit (100% money back guarantee) and give us information about your company along with your preferences for a website. In 2 days, you will get a unique website. Your annual subscription (included in the deposit) comes with web hosting, domain name, SSL-certificate, and access to a user-friendly Weblium Editor for you to manage your website at ease after it is ready. Buy your Construction Company website on Weblium now and weâ€™ll prolong your subscription for 30 days for free.